Ah, Fall. Such a lovely time of year. Days filled with foliage, apple picking, and various fun things to do outdoors. Nights filled with warm drinks, and cold sweats trickling down your back as you gorge yourself on everything spooky for Halloween... Well, at least that seems to be much of the case in the Smalerie household. Between The Boy's great love for bad horror movies, Mokey's wardrobe of costumes, and my constant internet research on Halloween themed food-items - it's a pretty great time to be a New Englander. And since I assume that many of our blog readers are like-minded Halloween-loving fools, I though I'd use my turn this month to share the Halloween comics I managed to scare up. Let's start with the most bleak, shall we? Before grabbing this one shot, I had never read any of the other Marvel Zombie titles other than that terrible Christmas one I reviewed last year. While I find many zombie stories interesting, it is not one of my top genres, so unless someone recommends it to me, I often skip stories about the walking dead. And to be completely honest, the idea of superheroes turned to zombies felt a little too trendy and gimmicky for my taste. I'm not going to go as far as to say I was pleasantly surprised by this title, but there were a few moments I liked. Zombie Squirrel Girl and her horde of furry minions was neat to see and I was surprised to discover how many characters I was able to recognize. The story itself is a bit thin and often feels emotionally manipulative as it makes sure to stuff in elements like adorable children and cute kittens trying to have just a smidgen of holiday fun in a world that is otherwise terrifying and bleak. 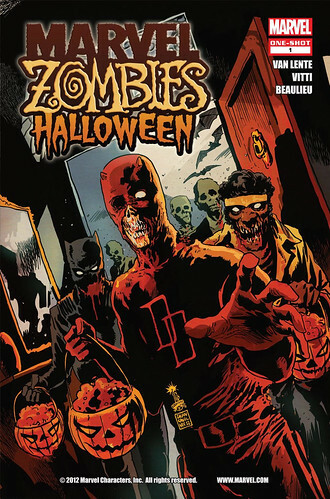 While I don't think it will make people run out to read more Marvel Zombies, it's not a bad 10 minute read as a subscription or $2 digital purchase. Oh man, did they have my number when they created this series. 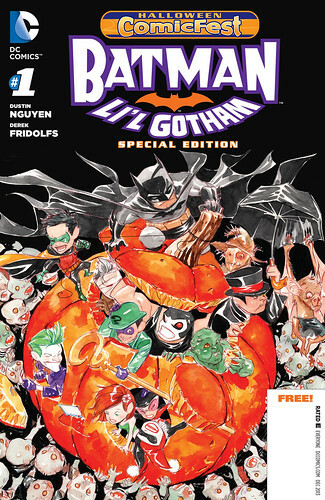 Another series with cutely drawn little Batman and assorted characters? Take my money now, fools! No, it isn't as good as Tiny Titans in terms of pure sweetness, but it is also written for a family-friendly audience and the art is just a ton of fun in terms of expression and color. There is a nice mix of humor and sentiment in this issue as Batman tries to prevent Damian from taking out every kid who made the bad choice to dress as a villain for Halloween. Damian comes off as bratty without going overboard and there was a moment or two that completely confirmed my theory that having Batman as your dad could indeed be a pretty great thing, especially when he buys you calzones for dinner. This issue is available online for $1 and was given out for free last year as part of Halloween Comicfest 2013. Not a huge investment for a little taste of the series. I fully intend to read more myself. What? Another Lobo Holiday book? Apparently, no one enjoys celebrating holidays more than the Main Man himself. Even if the story BARELY has anything to do with Halloween and has most of the action occurring in space. Who am I kidding? This really isn't a story. 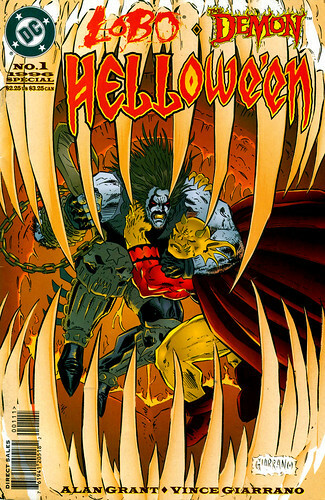 It's just an excuse to have Lobo and Etrigan team up again. That's ok with me though. It's just so ridiculous that you don't even care. Epic battle and cheap rhyming commence! On a more serious note though, I feel that this is the kind of book you either love or hate. You either revel in fact that Lobo fights a space dragon, or you roll your eyes at how over the top everything is. A book of this kind feels oddly nostalgic because the style of writing and art feel so rooted in the 90s. That isn't necessarily a bad thing for me. And just to alert you all of my bias, I will pretty much read any story that has Etrigan in it. He will both tear off your face and wear adorable booties at the same time. He's always worth digging through The Boy's comic boxes to find. So, readers out there in the internet's spooky mists, what are you up to this Halloween season? Any book titles you want to share with us? Or maybe just want to tell us how excited you are for Comicazi's Halloweeniversary this weekend? Well then, have at that comment box below. And be sure to show no mercy.